XMLBlueprint is the smart XML Editor for Windows with full support for DTD, Relax NG, Schematron, XSD (XML Schema), XSLT (1.0, 2.0, 3.0) and XPath (1.0, 2.0, 3.0). Its unique combination of just the right features and an affordable price for both professionals as well as home users makes it the smart choice for all your XML-related work. The 64-bit version is recommended for editing and validating of very large XML files (up to 1GByte). Context-Sensitive XML Helpers, based on XSD (XML Schema), DTD, and Relax NG Schema, for element names, attribute names and attribute values. Closing tags are automatically added. An options dialog lets you specify how XMLBlueprint should behave. XML Refactoring helps you change the structure of your xml documents. Sometimes a simple find/replace of text is not powerful enough to make subtle changes in your XML Document. For instance, if want to change all <p> elements into <div> elements you cannot globally replace "p" into "div" because this would also change text such as "simple" into "simdivle". Nor could you change <p> into <div> because then the </p> would still remain. It's much faster to use the XML editor's refactoring functions for this type of changes. The XML Formatter lets you indent text, split long lines, remove whitespace, handle empty elements, format attributes. You can specify how XMLBlueprint should format your xml file. For instance, what to do with empty elements and where to place attributes and text. XMLBlueprint correctly handles whitespace (the xml:space attribute), and you can override this behavior for specific elements. Folding simplifies working with large XML documents. Validate XML against XSD (XML Schema), DTD, Relax NG Schema, and Schematron. XMLBLueprint provides wizards to associate your XML Document with a DTD, Relax NG schema or XML Schema. XML Catalogs lets you redirect schemas on the Internet to your local computer, which makes validating your XML files much faster and more reliable. Supported Processors: Xerces, MSXML and Jing. 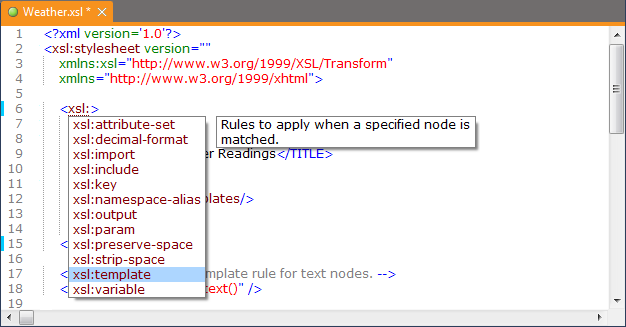 Run your XSLT Stylesheet with your choice of XSLT processor and view the output. XPath support with Syntax Coloring and Error Indication. Supports XSLT 1.0, 2.0, 3.0 and XPath 1.0, 2.0, 3.0. XML Generator to generate sample XML based on XSD (XML Schema), DTD, or Relax NG Schema. You can specify if you want XMLBlueprint to generate optional elements, optional attributes, attribute values, etc. XSD Generator to generate XSD (XML Schema), DTD, or Relax NG Schema from multiple sample XML files. Convert CSV to XML and Convert Excel to XML. Once you have created your scenario you can run it from the command line. To run conversions on a regular basis, you can use Windows' Task Scheduler. Download a free, fully-functional 15-day trial of XMLBlueprint. There are no restrictions and you don't have to register.